A number booklets were handed directly to migrants and asylum seekers and many other booklets were given to organizations that will continue to distribute them throughout Italy. It was a true pleasure visiting JNRC, a day center for refugees in the heart of Rome. Services address the needs of newly arrived guests, as well as the those seeking to settle in Rome. The day center is an open, welcoming place with numerous offerings. was created by and is now comprised of former victims of trafficking. The Women of Benin City know how to talk with these girls, and sharing the same dialect and the same past is a fundamental element that reassures them. maintains several projects leading women who have experienced gender-based violence to rediscover their identities, their values and competences, so as to find once again the will to build a new life. 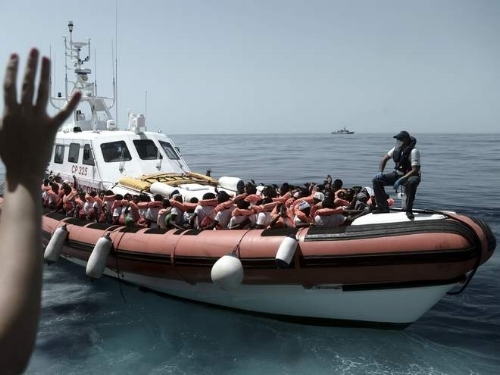 A rescue boat, carrying 224 refugees is turned away. Photo: Stranded refugees on an Italian Coast Guard boat as they are transferred from the Aquarius to Italian ships to continue the journey to Spain. The Aquarius-a rescue ship run by MSF-held 629 people, including 123 unaccompanied minors, 11 children and 6 pregnant women.